Ultra Baskerville Muzzle is the ultimate muzzle. Every aspect of the muzzle’s design has been created to combine maximum safety with comfort for the dog. The material is extremely tough and durable, yet malleable and soft to touch. The ergonomically designed safety strapping ensures the muzzle will always remain securely in place and features two additional points of secure attachment. The loop at the bottom is designed to attach to your dog’s regular collar and an optional over-head safety strap should ensure that even a canine Houdini cannot escape. The Ultra also has a secure metal buckle with pre-holed webbing, to ensure it is quick and easy to fit. The neoprene padding ensures it is snug and comfortable. As welfare is always paramount with our product design, the dog can pant, drink and eat through this revolutionary muzzle, which comes in six sizes to fit most dogs. For help in learning how to size your dog for an ultra baskerville muzzle, we have an instructional video here and a written article here that go into greater detail. Due to the muzzle shape and size of some breeds, it is not recommended that those breeds use the Ultra Baskerville Muzzle, as it will not fit them correctly. These breeds include: Boston Terrier, Bulldog, King Charles Spaniel, Lhasa Apso, Pekingese, St Bernard, Pug, and the Shih Tzu. I bought this muzzle for our Cairn terrier, Rocky, who through a series of homes before us learned to be aggressive and will bite if he feels threatened. And because he can't seem to distinguish between accidental hurt and purposeful hurt, our family and friends were subject to being attached if they accidentally hit him with their feet (which was likely because he loves to be around people and always gets in the way) making a muzzle a necessity. The video for acclimating a dog to the muzzle was priceless and really worked. He was using it without objection within a day. Now Rocky wears his muzzle whenever we have people over and I also use it for our daily walks and for vet visits. I have two other dogs, including another Cairn, and we have had problems with loose dogs in our area when we walk so having Rocky muzzled keeps fights from occurring. I purchased this muzzle in the tan color and it blends with Rocky's color, making it a little less noticeable. It's great because he can pant, drink water and get treats all while wearing the muzzle. We are very satisfied with this muzzle and both our vet and our dog sitter have approved of it as well. Nice job on the ultra design. My dog can longer nip or bite people. What a comfort for me when she is around other people. You have to make sure the unit strap is tight enough behind the ears, otherwise she can pull it off. This only happened once. (my fault, not the product.) this muzzle seems to be comfortable for her, and it seems to give me better control of her when walking. It also lets other people know that she may not be approachable. I've wasted money on other products, but this one is worth every dollar!! It gets 5 stars on my review. Looks like I'm going to keep my dog now. Thanks Baskerville, your friend , Thisa the dog. I purchased after much thought and trepidation, a Baskerville muzzle for my dog, Rupa. Rupa is a dog who will not, and I mean NOT let anyone clip her toenails. I was wasting money and impacting her health with constant short trims that only pissed off my vet and groomer and traumatized my dog. Rupa is a very wary dog with quite a bit of personal space. I only bought the muzzle on the remote hope that I could somehow train her to wear it. See, the muzzling caused her to totally lose it, out of all reason when she was trimmed. Once finally muzzled, she was already in full panic mode. Three grown men could not hold her. I decided to try the Baskerville muzzle. Even measuring her nose for it took three tries, as she is seeing me come at her with a string. After it quickly arrived, I slooooowly began to use the training method described. I used home made liver jerky as a jackpot reward and trained her tirelessly each day. I'll never forget the first time I managed to slip that muzzle on her face. And consequent days that we trained, building up to the buckling, using peanut butter on the nose part. After some weeks, she would be my little baseball catcher and parade the house watching for a treat, her nails snagging the rug as she walked. Yes, the day came when I did her nails, and yes, it was bad. However!!! She didn't bite me or anyone. She could pant and open her mouth to breathe. And guess what?? Next day I jiggled the treats and she lined up to be muzzled. THANK YOU, Ed!!!! I am using it to keep my dog from licking his wounds, but I will be using it on public walks to keep the overly aggressive public from being bit because they want to pet my dog. The muzzle is lightweight and easy to clean. After some adjustments I found a nice fit for Tucker. He seems to like it better than the cone of shame. I just wanted to praises Leerburg on a product and an online video. I have a rescued GSD that is dog and people aggressive. I recently purchased the Baskerville muzzle. 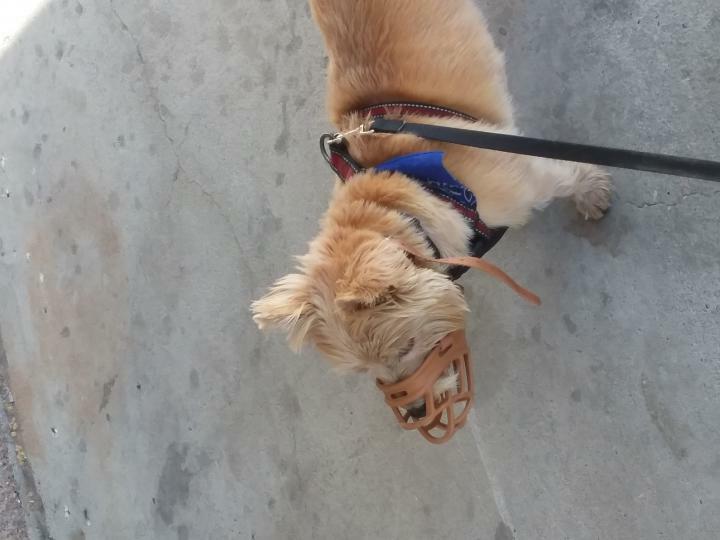 After watching the online video "Conditioning your Dog to a Muzzle," I was able to take my dog out for a walk with it on after 2 days. Obviously it is not his favorite thing but with some slight leash correction I was able to have him ignore it in 10 minutes or less. Thank you for providing top quality products and videos. I am a pet owner and not a trainer but Leerburg has helped me IMMENSELY. I LOVE our Baskerville muzzles! We have two adult Malinois and a Siberian Husky/Bulldog mix along with a parade of Military Working Dog foster puppies from the Lackland afb breeding program. All of these dogs learn to wear this muzzle. For example, we always muzzle for nail trims just in case I make a mistake and quick the dog. I try not to, but with thick black nails, it can happen. We watched the instructional video, "Conditioning You Dog to a MUZZLE" on this site and trained them all according to its clear, detailed directions. The dogs literally love these muzzles since they are closely associated with peanut butter. One of our Mals can be unpredictably reactive so she wears her muzzle whenever she is in public where her triggers could occur. It keeps her safe, and this muzzle is comfortable for her to wear so she doesn't mind it. 113 Lb GSD... Great Muzzle. Has plenty of mouth room and fits very well. Comfortable for long use. Strong and durable. I recently purchased an Ultra Baskerville Muzzle and it's a great product. My dog hardly cares that she has it on. She can receive treats, drink, and pant yet cannot get into trouble. It fits securely but comfortably and it is virtually impossible for her to get it off - in fact she hasn't even tried! She accepted it from day one. This is a very nice muzzle! My German shepherd is a size 6; he has a longer muzzle than the recommended size 5. It is very sturdy and a well fitting muzzle. This is a very open muzzle and allows maximum airflow. My dog has no problem eating or drinking with this muzzle on. Even if you don't have an aggressive dog this is a nice muzzle to have around in case of an emergency (better safe than sorry). My staffy chewed right through his muzzle would not recommend for a strong dog.